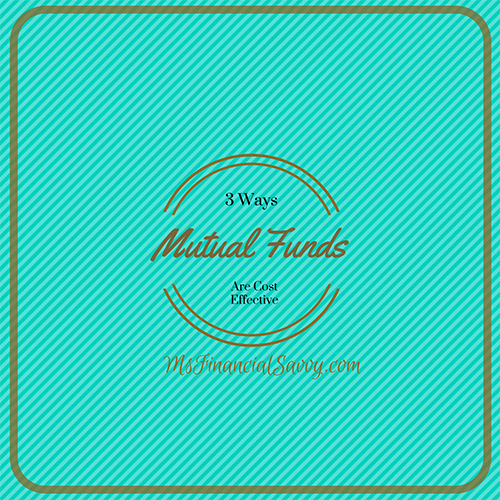 Mutual funds are cost effective mainly because you don’t have to pay to buy a mutual fund. Some investments including annuities and high cost mutual funds decrease your profits as time goes on. You can pay $0 per purchase, for a mutual fund bought directly form an investment company, or you can pay $8 for a mutual fund purchase through a broker. This means every time you purchase shares in a mutual fund you must pay a load. In no-load mutual funds there are still other charges that will affect your profits such as yearly fees. You can choose quality mutual funds with low yearly fees. I can demonstrate how to find mutual funds that have low yearly fees for you. There are many high cost mutual funds, but you can choose low-cost mutual funds that will significantly increase your returns over time, since yearly fees are charged every single year. As stated above there are many factors to look at. I can show you all the fees involved to maximize your mutual fund returns and show you that mutual funds are cost effective. There are many types of mutual funds, just because a mutual fund is medium or high risk does not mean it is not a good fund. I have made money on many medium and high risk mutual funds through the years. It only means that the ups and downs are less, and the risk of temporary decreases in value is much less. I can show you how to determine if you are a low, mid, or high-risk person. And I how to create a great mutual fund portfolio no matter what you are using it for. When you consider the load, the fees, and a few other factors, you will find mutual funds are cost effective ways to build your money.